The order said the Supreme Court's ruling is temporary, pending a federal appeals court's review of the issues. Washington: The Supreme Court dealt President Donald Trump's government a fresh setback Wednesday, saying its controversial travel ban cannot be applied to grandparents and other close relatives of people living in the United States -- for now. 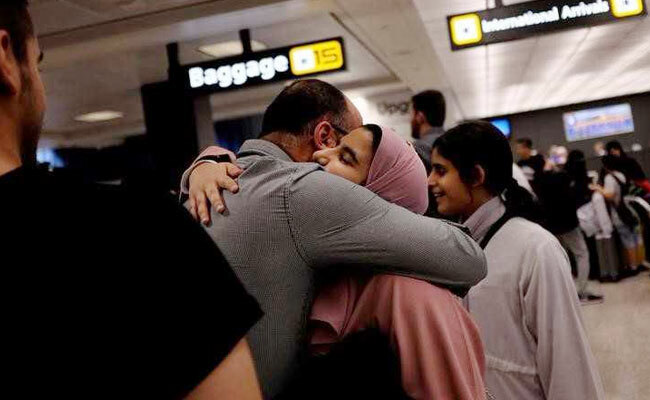 The court accepted a Hawaii federal judge's ruling last week that the Trump administration had too narrowly defined what constitutes "close family relationships" to determine exceptions to the ban on travelers from six mainly Muslim countries -- Iran, Libya, Somalia, Sudan, Syria and Yemen. That left in place Judge Derrick Watson's wider definition, which includes grandparents, grandchildren, nieces, nephews, and cousins of people living in the United States. But in its brief order, the court backed the Trump administration by staying the part of Watson's ruling that would have expanded exemptions to its 120-day ban on all refugees. The Supreme Court itself was partially the source of the dispute, having ruled in late June that the 90-day travel ban, aimed at better screening out potential security risks, can be broadly enforced for travelers from the six countries "who lack any bona fide relationship with a person or entity in the United States." Days later, the government interpreted that to mean that only "close family" was exempted -- which it defined as the parents, spouses, children, sons- and daughters-in-law, siblings and step- and half-siblings of people in the United States. Hawaii, one of several states fighting the travel ban since Trump first announced it in January, filed a court motion arguing that grandparents and grandchildren were by all measures also "close family." After Watson accepted that argument, the Justice Department appealed the issue to the Supreme Court, asking the court to make its own definition of "bona fide relationship" and "close family." In its order Wednesday, the high court refused. Watson had also ordered the administration to exempt from its 120-day refugee ban any refugee who already has a relationship with a US resettlement agency. But the court overruled that, allowing the California-based Ninth Circuit Court of Appeals to rule on the issue. The Trump administration issued a one-line response to the high court's ruling. "The Department of Justice looks forward to presenting its arguments to the Ninth Circuit," it said. Hawaii Attorney General Doug Chin welcomed the Supreme Court's ruling on travelers. "This confirms we were right to say that the Trump Administration over-reached in trying to unilaterally keep families apart from each other," he said in a statement. Added Omar Jadwat, director of the Immigrants' Rights Project at the American Civil Liberties Union activist group: "Given an inch, the Trump Administration has tried to take a mile in implementing the ban. That is cruel, unnecessary, and unlawful," he said in a statement. "We look forward to eradicating the entire Muslim ban, which is unconstitutional and repugnant to our most basic values as a country." US Senator Richard Blumenthal, a Democrat and longtime critic of the travel ban, encouraged the appeals court to be as expansive on the refugee ban as Watson was on the definition of close family for travelers. "The court correctly applied common sense to interpret family members as including grandparents and other close relatives and therefore to grant them an exception to the travel ban," he said in a statement. "Hopefully the same common sense will persuade the appellate courts to grant a similar exception to refugees having longstanding relationships with resettlement organizations funded by the US government. This interpretation would seem both good logic and sound law, as well as serving the humanitarian and national interest."